What a great start to the week! 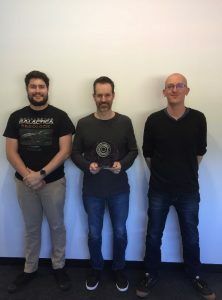 Today we learnt that SBC tenant Black Lab Games, was awarded the 2017 Australian Game Developer with their most recent development, Battlestar Galactica: Deadlock. What else can we tell you about Black Lab Games? Teigan caught up with Paul this afternoon while he was still buzzing with the excitement of it all. I’m Paul Turbett, managing director of Black Lab Games. We’re a video game development company, based here at Stirling Business Centre. We basically create and develop video games for PC and console. Tell me a bit about this prestigious award? It’s an award from the Australian Game Development Association. It’s for the most recent game that we created, a strategy game called, Battlestar Galactica: Deadlock, based on the TV show from the early 2000’s. The game lets you control a fleet of spaceships fighting against the shows cyborg villains, the Clyons. At the moment the game is only available on PC but we’ve got the Xbox and Playstation versions coming out later this year. To stay up to date on their release check out our Facebook page, https://www.facebook.com/blacklabgames/?ref=br_rs. How long did it take you to make the game? The initial pitch was about two years ago, we started developing the game around March last year and it’s available to purchase on Steam now. So it was a very quick process which is a testament to where Black Lab Games is now at. What did winning this award involve? Initially, we had to make a submission to nominate the game for the award, and then we were shortlisted as one of the sixteen finalists. My colleagues and I then went over to Melbourne for the awards ceremony, just last week. The ceremony was impressive with a couple hundred people there and I got to give an acceptance speech which was a bit scary but fun and exciting. Because our game is awesome! Would you say this is a proud moment for you as a small business owner? Most definitely. This year was the first year that West Australian developers won at this national competition, so it’s pretty cool to see that we’re growing and getting to this point where we get the opportunity to win national awards. Receiving this award has been great recognition for our company and our hardworking team. Do you think receiving this award has the potential to take your small business to the next level? I think its good recognition of the hard work and dedication that we put into the development of this game. It’s also advancement for our company as a development studio as it shows the growth and the improvements that we’ve made over the past year.